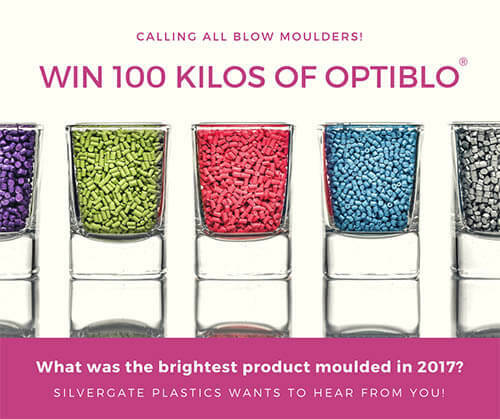 Silvergate Plastics is set to give away one hundred kilos of Optiblo® to the brightest blow moulder of 2017! Silvergate Plastics is on a mission to find the most vibrant colour used by blow moulders in 2017! The UK’s largest manufacturer of custom colour masterbatch has launched a competition that gives blow moulders the chance to win 100 kilos of the performance enhancing colour masterbatch, Optiblo®. Silvergate’s competition is simple. Blow moulders are asked to enter by sending a colour sample or the colour reference used to create the most colourful product moulded this year, along with a description of the product. Silvergate will then select the most vibrant colour and reward the winner with 100 kilos of Optiblo® masterbatch, matched to any colour of their choice! You have until 15th January 2018 to enter this exciting competition! Optiblo® is Silvergate’s revolutionary signature masterbatch, created to slash cycle times and improve the appearance of blow moulded products. Optiblo® enables the polymer to flow faster and at lower temperatures. It reduces energy consumption, eliminates die lines and increases output. To enter, please email your colour reference and product description to optiblo@silvergate.co.uk. Alternatively, you can message Silvergate on Twitter @Silvergate_UK or www.facebook.com/silvergateplastics. You can also mail a sample of the colour, along with the product description, to Silvergate Plastics, Unit 53, Clywedog Road South, Wrexham Industrial Estate, Wrexham LL13 9XS. Entries must be received by 15th January 2018. Entrants will be entered into a prize draw and the winner will be announced in February 2018. T&Cs apply.